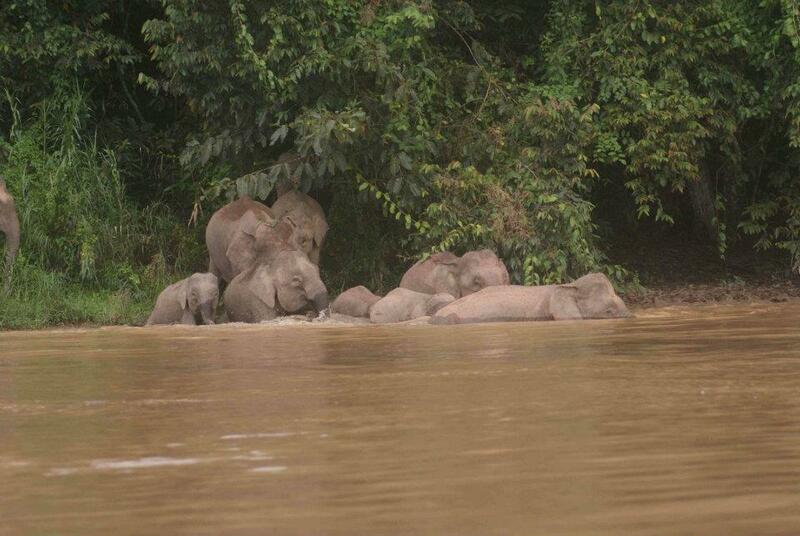 Elephants crossing the Kinabatangan river (image credit: Danau Girang Field Centre). The Sabah government has decided not to proceed with the proposed bridge to be constructed in the Lower Kinabatangan area, which had threatened to further fragment the area. KUALA LUMPUR, 21 April 2017 – Yayasan Sime Darby (YSD) welcomes the Sabah government’s decision not to proceed with the proposed bridge project in the Lower Kinabatangan area. The proposed Sukau bridge project was to connect the western river bank to the Sukau village on the East and a road to connect Sukau to Litang and Tomanggong, over 40 kilometres away to the south-east. YSD Chairman Tun Musa Hitam said the Foundation has been working with Nestle Malaysia on Project Rileaf to rehabilitate critical riparian areas in the lower Kinabatangan area. As of December 2015, under the project, 480,000 trees have been planted on 2,300ha of forest in the area, providing income to 190 people from the local communities. The communities themselves are involved in the planting, providing seedlings for the project via community-run nurseries. YSD has committed RM3.3 million to the local community for their various roles in the project. “I would like to thank the Chief Minister of Sabah, Datuk Seri Panglima Musa Aman, for taking our views seriously and making a pragmatic decision on the construction of the bridge. “YSD has been working with Nestle Malaysia and the Sabah Forestry Department since 2014 with the hope of not only creating a viable habitat for the host of wildlife that the area supports, but also to support the communities. “The construction of the bridge would have disrupted the connectivity for wildlife within the Lower Kinabatangan Wildlife Sanctuary and our current efforts to restore the ecosystem of the already fragmented forest,” he added. YSD has committed RM84 million for various environmental conservation efforts in Sabah, the largest amount committed by the Foundation in any state in Malaysia. Under its Environment pillar, YSD has, to date, committed RM130 million towards the protection of high conservation value ecosystems, vulnerable and endangered species as well as initiatives promoting the preservation of the environment and biodiversity.